The Special Edition Xbox 360 250GB Console with Kinect. Kinect brings games and entertainment to life in extraordinary new ways-no controller required. Easy to use and instantly fun, Kinect gets everyone off the couch moving, laughing, and cheering. See a ball? Kick it. Control an HD movie with the wave of a hand. Want to join a friend in the fun? Simply jump in. Wi-Fi is built-in for easier connection to the world of entertainment on Xbox LIVE, where HD movies and TV stream in an instant. Xbox 360 is more games, entertainment, and fun. Package contents: Charging Station for 2 Battery Packs, 2 Xbox 360 Rechargeable Batteries, Charging Cable. High Quality Guaranteed 6FT RCA Audio Video Cable for Xbox 360. This Xbox 360 RCA AV Cable provide high-definition graphics on your PC monitor or HDTV using the VGA input. 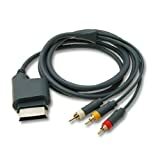 This Xbox 360 Audio Video Cable play high-quality audio with the included stereo connection or use the optical audio port for digital sound. Xbox 360 AV Cable with DV-15S standard VGA connector for optimum picture quality. Progressive-scan DVD playback in 480p. This is a non-OEM generic product. Outshine the competition and play in style with an Xbox 360 Special Edition Chrome Series Wireless Controller, available in gold color chrome for a limited time. It also comes in your choice of blue, red, and silver chrome. Plus, this controller features a transforming D-pad for precise control. 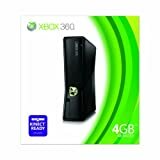 XBOX 360 S STD SYSTEM 4GB 4GB. 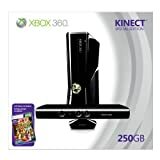 The Special Edition Xbox 360 250GB Console with Kinect. Kinect brings games and entertainment to life in extraordinary new ways, no controller required. Set across three defining eras from 20 years of Sonic the Hedgehog video game history, the instantly recognizable environments of Sonic Generations have been re-built in stunning HD and are now playable in both classic side scrolling 2D from 1991, as well as modern 3D style found in Sonic’s most recent adventures.